Josh Duff | Running my first campaign! Less than a year ago, I jumped off the high-board of nerdiness into the deep end of the role-playing pool - and ran my very first campaign. I wanted a fun campaign (duh) with rules and story that would be hard for me to mess up. For most of the campaign, the only players were two good friends with solid role-playing experience, so I was able to rely on the players to contribute a good amount of quality. I took a stab at running an old-west campaign, borrowing every western-movie trope I could think of. The PCs played gunslinging lawmen for hire, riding into a town oppressed by a gang of n'er-do-wells populated with plenty of tobacco-spitting, expendable, no-good outlaws to gun down. Without going into too much detail: the players cleaned out a counterfeiting operation in an old widow's basement, were recruited to clean up the town, used aggressive negotiations to get rid of gang members harassing the mayor's house, and stopped another group of enforcers who were coercing money from some water-starved farmers. Back in town, they took over the town prison, had a gun fight in a booby-trapped house, escaped just as it blew sky high, confronted the aristocratic gang leader on the porch of his ranch house, and finished with a gun battle on main street. At the recommendation of an experienced GM, I used the Boot Hill (second edition) rules, a creation of Gary Gygax and Brian Blume. Any wound at all gives you a -5% chance at getting to shoot first, and also to hitting the other guy. Once your strength drops below 50% of what it is normally (which can often be done with a single serious wound), you start getting -20% to shooting first, and hitting. It's a simple system, but one that facilitates characters dying pretty often. A couple good rolls, and a single shot can permanently take out any character - even if he just rolled into town with a new bandanna and a pocket full of hit points. I wanted my players to enjoy a good old-fashioned movie version of the wild west. They were supposed to play the heroes - the guys who go flying through bar windows and come up swinging! Standard nerfing - most of my NPCs would drop below half strength after one serious wound (which severely limits a character for the rest of the combat). The player characters could took at least two (non-mortal) wounds before things got really sticky. 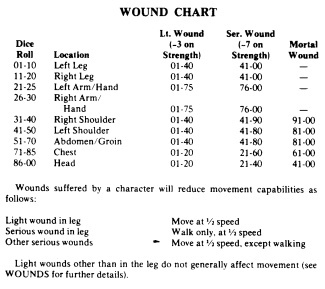 According to the rules, healing is a fairly slow process, taking days or weeks to recover from any sort of combat wound. My player characters needed to be able to get into gun battles every few hours - they could be rejuvenated by a good night's sleep, or the restorative powers of a kindly old lady's stew. I decided to take a hint from the awesome and successful video game Left 4 Dead. In that universe, survivor characters who go down are immobilized, but can still fire handguns until their teammates pull them up (or the zombies fill up at the brain buffet). 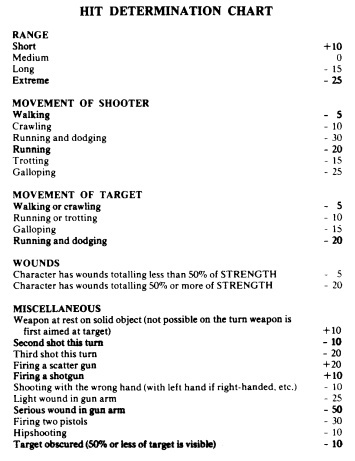 Any time one of the PCs took mortal damage, I did something similar - instead of the characters dying, they dropped to the ground and could fire their handguns at a reduced rate. If another player made it over to them and used a round to pull them up, that character could enter the fray with some of their strength restored. It wasn't a mechanic that saw a lot of use, but it turned several potential defeats into narrow victories. I was happy with this - narrowly beating the baddies is a lot more exhilarating than seeing one side gun down the other like dogs. I found it a highly enjoyable experience, but there were weak spots. The campaign was fairly light on dialog, which isn't necessarily a bad thing - I just wish I were better at having a conversation in character, and thinking on my feet. My weaknesses were most evident in the final session, where my PCs held the big baddy in prison and were looking around for a way to prove his guilt (they were lawful, after all) or uncover the next plot hook. I left them wandering around looking for a clue far too long before I initiated the next action for them to deal with. They grilled the prisoner for some time (good roleplaying, at least), looking for the magic words that would advance the plot. Blah. I was very glad to have such great (and forgiving) roleplayers in my campaign. When the GM is fresh, there's a lot less room for noobs or troublemakers. I'm definitely sold on lightweight rules sets, especially when going for a more cinematic feel. The less of a barrier there is between the players and the cool things they want their characters to do, the better. I have a suspicion that we might try this (noobs GMs practicing with friends) again sometime soon - if you have any suggestions for easy-to-pick-up gaming systems, or good scenarios for some one-shot sessions, then surrender your knowledge to my gaping mind-hole!